There are several DIY bathroom safety products available that you can install yourself to assist in making your bathroom safe. Compliment our step through insert with seats, grab bars, curved shower rods and skid resistant applications. Or install any of these bathroom safety products on their own. This stylish and useful bathroom safety product is quick and simple to install. No tools, equipment or permanent structures are necessary for installation. The transfer bench can easily be moved back and forth along the ledge or removed for storage. It can also be used while bathing as a shelf to hold a book or beverage. Removable bath seats are great bathroom safety products. 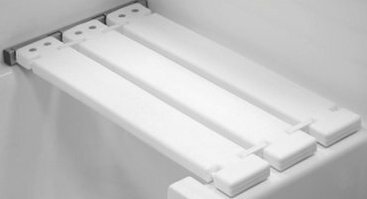 Install bath seats on the back rail of your tub. Leave in place or remove the seat for storage when not in use. This 28″ seat includes hardware and rubber pads to protect the tub surface. The patented design meets ADA requirements and is easy to install. These bathroom safety products are only available in white. We also offer several ADA compliant grab bars. Each grab bar is commercial grade with a 500 lb capacity. They are available in 4 color options and 6 lengths. 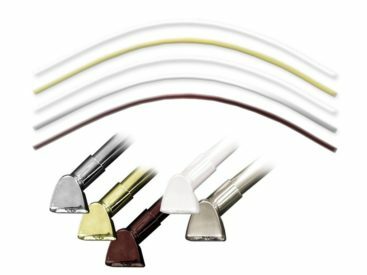 Install these bathroom safety products either vertical, horizontal or on an angle to a variety of surfaces. This kit includes the mounting anchor set. After installation of the step through insert you are no longer able to fill the tub with water. 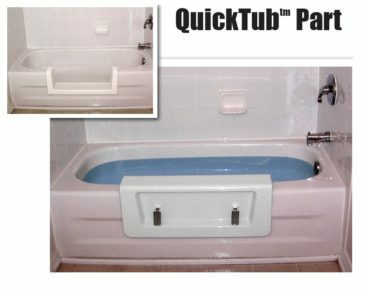 However, if you would still like to be able to fill and use it for bathing; the Tub Conversion Cover / QuickTub Part is the solution! 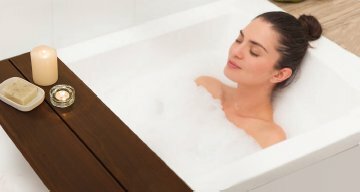 The Tub Conversion Cover was designed specifically to fit over the small or medium step through insert and seals the space so it can still be used as a tub. This part is easy to install and remove, while also providing you the option to switch between an easily accessible shower and tub in seconds. Curved shower rods keeps floors dry by curving in at the corners. As a result, these bathroom safety products keep the curtain in the tub and water from leaking out. This unique curved shower rod also gives more comfort by creating additional elbow room and showering space. 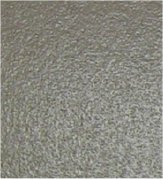 The curved shower rod is available in either a 5′ or 6′ length and available in 5 finishes. The installation kit comes with everything you need including the hardware, mounting brackets and step by step instructions. With our slip resistant coating you no longer need ugly non-skid strips or rubber mats. Instead, you can protect the surface and maintain the original beauty of the material. Treat nearly any surface including fiberglass, acrylic, glass, granite, marble, metal, plastic, vinyl, slate, tile, concrete, and wood. Unlike strips, mats or conventional anti-slip bathroom safety products, our extremely durable slip resistant coatings do not attract dirt. As a result, you can clean easily with a mild detergent or soap and water. Our 8 oz bottle provides enough for 3-4 tub bottom applications. It appears white during application and cures to a clear finish. You can walk on floors in as little as 4-6 hours. However, for the best cure allow 24-48 hours. Buy any of these products from our online store.